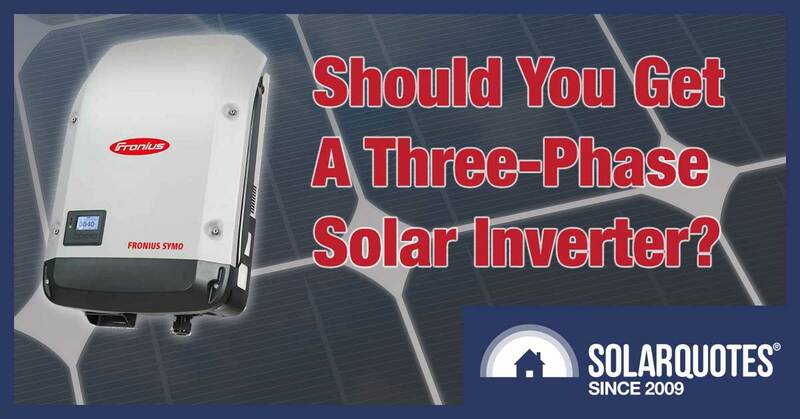 Home > Solar Inverters > Should You Get A 3 Phase Solar Inverter? If your home has a three-phase supply and you do not want or need micro-inverters then my recommendation is to use a three-phase solar inverter over a single-phase model. What the hell is a three-phase solar inverter? A three-phase solar inverter takes DC electricity from solar panels, chops it up and sends it out as AC electricity shared across a three-phase supply. DC in. Three-phase AC out. If it is a 3-phase Fronius it will say ‘Symo’ on it. If it is a 3-phase SMA it will be blue. What the hell is a three-phase supply? Most homes in Australia have a single-phase electricity supply. This means that they have one live wire coming in from the grid. A three-phase home has 3 live wires coming in from the grid. And of course a three-phase supply means you can send much more solar energy back into the grid compared to single-phase (three to six times as much depending on your local DNSP rules). How do you know if you have a three-phase supply? The main switch on a three-phase switchboard. The meter isolator on a three-phase switchboard. 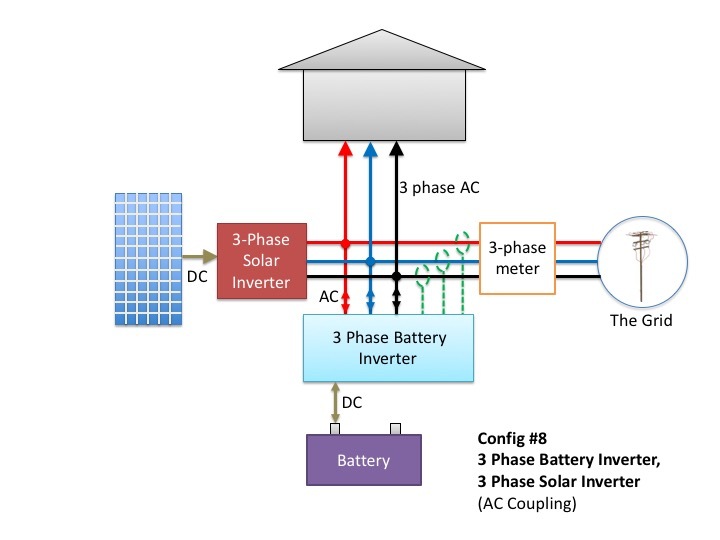 What are your options if you have a three-phase supply and want solar power? Any of these choices are valid. It will not affect how you are billed for exports or how much solar energy is self consumed. But, I still recommend a three-phase solar inverter. Why do you recommend a three-phase inverter? Spreading the inverter capacity across the three wires coming into your home means that you don’t have to push the solar energy as hard to get it out to the grid. You’ll be increasing the local grid voltage less than a single-phase install and you’ll have less throttling or tripping off due to over-voltage issues. That means more solar power production with our high-voltage plagued Australian grid. Voltage rise related solar issues are one of the biggest problems we see with installed solar power systems. I go in to detail on the causes and solutions for voltage rise issues here. If you have a three-phase supply I recommend getting a three-phase solar inverter. Why? Because it drastically reduces the chance of having voltage rise issues. But not everyone agrees with me on this. There is one downside to using a three-phase inverter other than the extra cost (expect to pay $300 to $500 more compared to a single-phase inverter). Three-phase solar inverters do make it much more expensive to have ‘Apocalypse Proof Battery Backup™’. What is Apocalypse Proof Battery Backup? My definition of regular battery backup is this: when the grid goes down your battery system powers some specially selected ‘essential circuits’. If the battery gets drained during the blackout, your home will black out too. In this configuration, the solar panels cannot charge your battery without the grid. My definition of Apocalypse Proof Battery Backup : when the grid goes down your battery system powers some specially selected ‘essential circuits’. But if the sun is shining the solar panels help power your home and recharge the battery too. If you are careful with your consumption, you can carry on indefinitely charging the batteries with the sun by day and using the battery at night. 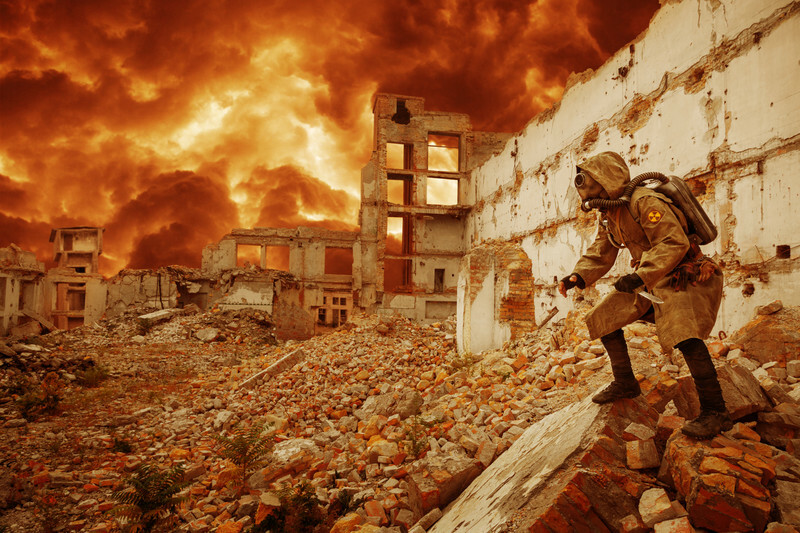 Why a 3-phase solar inverter makes Apocalypse Proof Backup very expensive. A single-phase solar inverter and an AC coupled battery. The backup is all on the ‘black’ phase. When the grid goes down in this configuration the battery system isolates the house from the grid (islands) and keeps 230V on the ‘black’ phase so the solar inverter does not shut down. The solar panels continue to send power to the house and battery. The solar inverter is throttled using frequency shifting if there is ever more solar power than the house and battery can handle. But if you add a battery to a system with a three-phase solar inverter it is more complicated. If the grid goes down you need to keep 230V on all three-phases to stop the solar inverter shutting down. A battery with a single-phase battery inverter (such as a Powerwall 2) cannot do this. You will be able to have ‘regular’ backup – but once the batteries are drained you’ll have no power until the grid comes back. Or you have 3 batteries and battery inverters – one on each phase. But again – I don’t know of any battery systems that can play nice with a separate three-phase solar inverter. The Powerwall 2 cannot work in this configuration. Yet. What’s more important to you? Apocalypse Proof Backup™ or stable solar generation? In my humble opinion it is better to have a system that operates well 99.9% of the time (when the grid is available) over one that operates really well 0.1% of the time (when the grid is down). But perhaps your grid electricity goes down much more than that and getting through long outages is your priority. In that case you may want to install a single-phase solar inverter on your 3-phase supply. Just make sure that your installer checks your local grid voltage and voltage rise before you get solar installed. And hope that your local grid voltage stays low in the future. You could also install a three-phase hybrid inverter instead of a three-phase solar inverter. But bear in mind that any future battery must be compatible with that inverter – often that is only 2 or 3 battery models and they may be obsolete by the time you decide to buy them. So choose wisely three-phase dweller. And do the right thing based on your local grid voltage, your local grid reliability and above-all your zombie tolerance. Good write up Finn. 100%, not doubt, you should get a three phase inverter (if you have three phase at your home or business). This way you could split your solar system in three and split the load on your phases evenly. For eg. don’t have your air cond., fridge, dryer on the same load, split them around with your lights and power to even out the demand as not to overload one phase. Cheers for now. 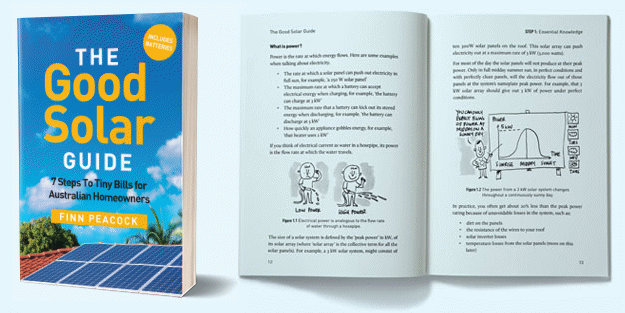 Finn wrote>> The solar panels cannot charge your panels without the grid. Is it worth getting 3 phase power to take advantage of the bigger export limits,and the stability advantages you write about? I have also noticed that quite a few ground or air sourced heat pumps for heating and hot water are somewhat more efficient with 3 phase, or only come in 3 phase, so combined, I am wondering whether it is worth the installation costs? It depends how much they are going to hit you up. Getting 3 phase on a new build is not much more than single phase. Adding 3 phase to an existing build can be very expensive – depending on your site. Your DNSP can quote you yo upgrade. Having 3 phase is going to become more important as the voltage on the grid gets higher (as more solar goes in) and as people need to charge their electric cars. And yes – heat pumps are a but more efficient with 3 phase. 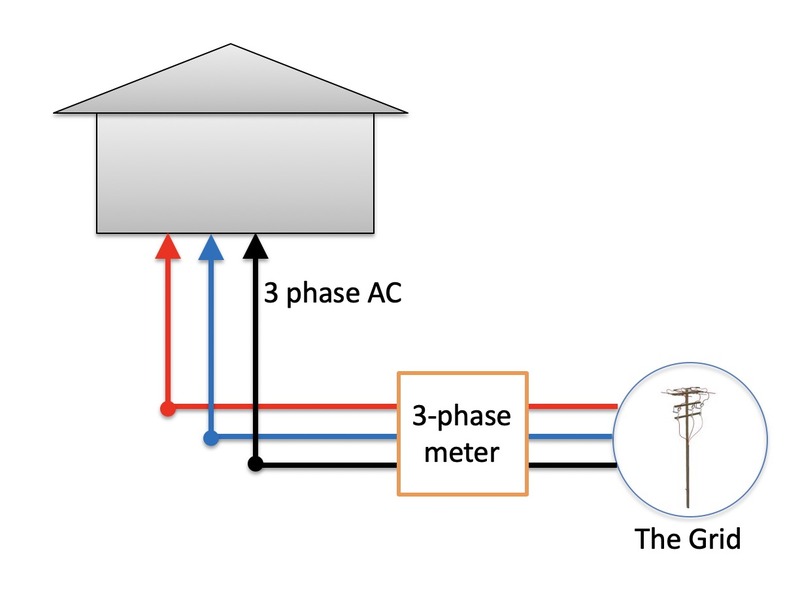 A possible disavantage of using 3-phase inverters. I have 6.24 kW of panels arranged in 2 MPPT strings on an SMA 3-phase 5 kW inverter, installed nearly 2 years ago This worked very well at first, but as more and more houses installed PV, I noticed our power production was dropping very noticeably. On further investigation (using the Smart Meter, and the inverter’s read-out), I found the 3 phases were reasonably balanced in the morning and evenings (little PV generation), but during the morning 1 of the phases would go very high – approaching our 254 Vac regulated limit (240 V +or-6%). In the afternoon, another of the phases would approach that limit, but the 3rd phase would always stay at about 242 V.
My inverter’s manual says that it commences throttling (or perhaps better described as limiting) at 250 Vac, and limits to zero output at 255 V line voltage. I was noticing our inverter was limiting ALL phases, if ANY phase was high. The current on each phase was the same. Seems like an opportunity lost – it would have been good for the inverter to redirect power on a high phase, to a lower phase – although I guess there maybe grid stability if all inverters had this feature. I can see it would make sense to the manufacturer, to design each of the phase inverter outputs to be rated at 1.67 kW (x 3 = 5 kW). But, if I had a single phase inverter, I could have simply swapped it to the consistently low phase, and all would have been good. Clearly, the PV generation on the grid was not being managed very well – and many 3-phase consumers were fitting single phase inverters to save cost (or – the installers were promoting this, to offer a better “package”). The Utility stated they were powerless to do anything – but appear now to have found a way, after I escalated this up to our Energy Minister. So – after experiencing equipment damage (CFL lights, motors, power supplies) from the excessive voltages (but within the regulations), and a loss of significant feed-in tariff, we are now back to where we should have always been. In this respect (Utility has little control over grid management), I suspect there is a weakness in the REBS scheme – management of the grid has been usurped by the installation companies. You didn’t touch on the other ( and BEST ) alternative, perhaps because it’s unusual for most people to have the roof space. 3X solar arrays + 3X single phase inverters + 1X Powerwall 2 = bill bliss and I have Apocalypse Proof Battery Backup™ too. That’s absolutely a valid design and a cracking system. But it is much more expensive. In terms of hardware, 3 x 5kW single-phase inverters will cost about 50% more than one 15kW three-phase inverter. The inverter installation is 3x the work. And you don’t get the voltage and frequency stability benefits of a three-phase inverter. You do get the redundancy though – as you say. I got lucky with the economics of all stages and I did not do it all at once. It’s worthwhile looking into if you have the roof space,. I have a similar set up (3×10 panels) & 3 inverters which @ THAT TIME were not that much dearer. The other advantage of the setup was the internal resistance of the inverters was lower than a single inverter allowing lower threshold for energy capture &c.p. higher energy yeild. WTF is apocalypse proof backup? It’s a funny way of saying you can have a blackout go indefinitely and still have power because the battery is charged by the PV system even though the grid is down. Mark your energy plant setup sounds like a good opportunity to be further exploited, depending on your feed in tariff situation. Why not reduce your bill to $0. Consider Standalone Off Grid whilst maintaining your Grid Service (on no load) for 3 months to evaluate how your Off Grid Solution manages your premises usage needs. A 57 PV Module Array (add another 3 modules = 15S x 4P Array) is around 15+ kW which is the ‘sweet spot’ for an efficient 550 – 650 DC Bus Solution, DC Coupled with a 200 – 300 AHr @ 480 VDC nominal Storage Battery along with a single Standalone PV 20 or 25 kW 1 Phase Inverter; or 30 kW 3 Phase. The outcome would be a substantial and robust solution that would meet most needs, and most importantly for those occasional high demand needs that might not be met, don’t forget that for well designed Off Grid Solutions; “a little gasoline every year goes a long way”. Maybe something to consider at some point Mark. Thanks Finn. I understand that Enphase is just in the process of releasing a 3 phase solution also, which potentially provides an addition option for consderation. This might also be critical for anyone who has shading issues. Yes – the 3 phase component for Enphase should arrive is Australia any time soon. If you have shading you can also use Tigo optimisers on a string system. It is very cost-effective to selectively add Tigo to only the panels that get the shade. I thought Enphase 3-phase components are available in market now. I am getting an installation done in next couple of days with IQ7+ Enphase mico-inverters with 3-phase cables and components. I hope the installers are not planning to use single phase components. @Finn is it possible for you to confirm the availability? Onya Gordon…. and I’ll bet you also don’t have harness your horse to Ferrari in case the price of fuel goes up. If I were in the market for a 3 phase solar or battery system, one of the things I would want to understand better is how they deal with unbalanced loads across the phases. Bear in mind that most of the loads in a domestic environment are single-phase. Only certain loads, like large air conditioners will be 3-phase. In a domestic environment I would say you are generally guaranteed to have the loads across the phases unbalanced. I would thus want to be certain that my solar and battery system can cope with that, and how efficiently they cope with that. I’m not an engineer but could you have a dummy load on each phase that automatically switches on when supply exceeds demand? 1. I suspect 3 phase solar inverters are always likely to be a problem if you think that 3 single phase batteries are the solution to allow the solar to work in a blackout with the battery for ANY solution that uses frequency shifting to throttle solar output. The problem is that in this setup, you would need to use frequency shifting on individual phases to make sure you can reduce solar output when needed and the battery and household loads can’t absorb all of the power. 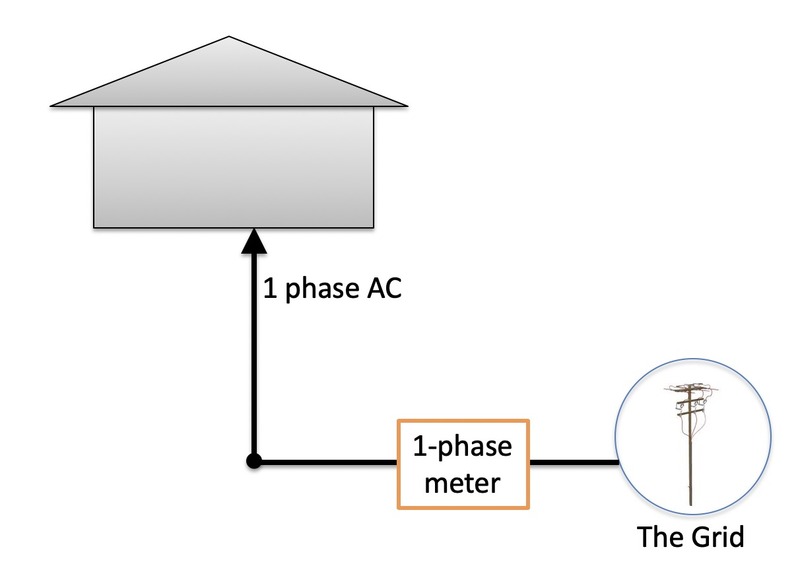 The problem with this is that when you do this, the 3 phases will enevidably move independantly and at some stage they will not be 120 degrees out of phase as would be required for true 3 phase loads. While a lot of use cases will not care about this if there is no 3 phase loads, I doubt any knowledgeable vendor or installer would want to install like this for fear that this might 1 day break a 3 phase load of an unsuspecting end user. Solution to this would be to use some other mechanism than frequency shift of throttling of solar output (and this would probably bring other benefits), but that does not seem to be the way the industry is moving at the moment, Of course the other option is 3 phase solar and battery inverters that can supply different loads to different phases in a blackout, and also charge the batteries from whichever phases have the spare solar power, but again I am not aware of any products that are doing this, and all the standards solar 3 phase solar inverters must follow is more about ensure equal output on all 3 phases for grid stability, which is totally unsuitable for islanded requirements in a blackout. 2. For anyone thinking that the solution to get “Apocalypse Proof Battery Backup” setup is to use micro inverters on 3 phases, or even 3 single phase inverters to get the benefits of solar on 3 phases AND battery on single phase to give the backup. The problem is that AS4777.2015 has requirements that even single phase inverters must trip off if there is a phase unbalance. So technically Mark Shueard system if build today to AS4777.2015 requirements probably should have solar tripping off in a blackout. I am guessing that the reason it probaby works for him is that the solar is either pre AS4777.2015, or implemented in a way to get around this. But I thought this is worth pointing out, because it would be unwise for people doing this type of install to just assume it works. Same thing applies for micros, and new enphase micros in particular. I like many people have enphase micros install across 3 different phases. With my old M215 and old Envoy (pre AS4777.2015) each phase worked in isolation (solar could keep working on any phase that is up, irrespective of what the other phases are doing). But with newer S270 and new Envoy-S AS4777.2015 compliant setup, when one phase goes down, the whole system goes down. This is a massive “incompatibility” with the current AS4777.2015 standards that all grid connected inverters must comply and any requirement for the “Apocalypse Proof Battery Backup” that I really feel needs to be addressed in the standard. Finally Finn, I am curious about your comment to Marks post above that his setup “And you don’t get the voltage and frequency stability benefits of a three-phase inverter.”. Can you expand on what you are talking about there. When I 1st read, I assumed you might have been suggesting his setup did not address the voltage rise issue, but I would assume a 15kw 3 phase inverter would trigger exactly the same rise as 3 single phase inverters pumping out 5kw?? Or are 3 phase inverters somehow outputting between the phases, rather than between active to neutral. I have not got my head complete around it, but I guess if you are putting output between phases at 400v rather than between active and neutral at 230v that will be less current for the same output, which is less voltage rise?? While I have 3 x identical ( BOSCH ) inverters, 2 of them are pre AS4777.2015 profiles. The one that is running on the main load and battery phase is one of these. I too struggle to understand voltage shutoff /throttle / ramp up / requirements of the latest standard. One of these inverters meets that spec but has never shut off or ramped due to voltage. The other two have never shut off either, I have seen the main phase voltage at 256 V regularly and touching 258 at times, never shuts off. I too didn’t understand what Finn meant regarding voltage stability benefits, all I can say is I have never had any inverter go offline for voltage spiking. All this is a complicated area that not many people understand well including a lot of installers (or for that matter myself so always good to find people who know the details and can reliably educate us all). The fact that you are using pre AS4777.2015 on your battery phase probably has the advantage that there is probably no chance a phase imbalance was you would experience in a blackout result in your solar not being able to work in a blackout. But there is the downside that this inverter and profile probably does not support frequency ramping (where solar output can be progressively throttle to balance generation and load). This does not mean you can’t use the solar in a blackout, but will probably just resulting in more “banging” the solar inverter on and off, something that some people have had some concerns might impact the longevity of the inverter. BUT, having said what I have said above, irrespective of what it says in AS4777.2015 about the requirement for even single phase inverters to shutdown on phase imbalance, I would not be surprised if that is often not implemented in single phase installs, and especially if they are not all done at the 1 time. I suspect this would be very easy for the install not to do. As near as I can figure out, to do this, you would need to install a bunch of extra stuff to even know that there was a phase imbalance which would not normally be provided with a single phase inverter install. So apart from complying with an overly draconian standard, there is probably very little reason someone on the cold face would want to go to the effort. You will probably find that the main target was micro’s which are more commonly spread across 3 phases in 3 phase setups. And so my guess those responsible for the standards where probably more interested in checking that people like Enphase had this implemented, and in truth with the centralised management that comes with systems like Enphase, it is probably more easy to implement. Doing so with single phase inverters is really a can of worms that would easily be circumvented by installers or home owners anyway. 1. a lot of the voltage thresholds are based on 10 minute averages. So just because you see a temporarily higher voltage, does not mean it has to act on it. 2. there are things like “volt watt mode” which will commonly not see the inverter switch off until voltage is 265V and this can be increased. See https://www.gses.com.au/wp-content/uploads/2016/09/GC_AU8-2_4777-2016-updates.pdf. So it is possible that your AS4777.2015 inverter was throttling, but not shutting off??? In fact it might even be tweaked so that even at 258v the throttling might be minor enough for you not to notice even if you were looking. But if I were you, and you voltages of 256v and 258v were not purely due to voltage rise (which will be there whenever your solar is exporting), I would be getting your supplier to tap the voltages to you down to be within the standard below 253v. Only the battery phase reaches 258V , the other two do not, they reach 252V. It is of note also that when my battery was re-installed in July ( swapped out a Sunverge for Powerwall) the installer swapped the phases around so he had red instead of white as the main phase. ( maybe he likes red better than white ). At the time, I though that is weird but if you have a colour fetish no problem , go for it. Then after he left I remembered that the white phase had the lowest voltage and that now my battery phase went from the lowest to the highest of the three phases in voltage. I’ve been watching it and being ready to ask them to come back if I got PV shutdowns – but so far I have not seen it. I do not believe there has been any throttling either on any inverter. I tested blackout and it performs as intended, phase 1 PV still functions ( only when battery is over approximately 80% full by design apparently ) and charges the battery. Yes, each of my systems is on a separate phase, by compliance and SAPN approval requirement. That comment was really a question to Finn about 3 phase inverters (you have 3 x single phase inverters). Single phase inverters output between Active a Neutral, with I assume each of your single phase inverters connected to a different active phase (Neutral is common). I assume 3 phase inverter is effectively the same, with 3 active phases and 1 Neutral. But this might be a bad assumption on my behalf and it could be that is outputs Phase A to Phase B, Phase B to Phase C and phase A to phase C. When you go phase to phase the voltage is 400 odd volts (not 230v), and this might have benefit for voltage rise (but I don’t really have my head properly so thus why I thought I would ask Finn, who might be across this better). From experience, I feel you’ve got it wrong. I had an SMA 3-phase inverter fitted, and it throttles if ANY ONE of the phases goes high. We had 1 phase go high before noon, another at, and after noon – so a lot of throttling. Like many (most?) people, I rely on the feed-in tariff to make PV economic, as we use most power morning and evening, when PV is not producing. One of our phases was remaining significantly lower – so if I had a single phase inverter, I could have had it moved onto the lower voltage phase. Have you checked your consumer mains and if it is not your fault (less likely to be you if you have a 3p inverter) asked for the DNSP to tap your local transformers down? Asked all that – my meter was logged, not my problem – suggested local transformer tapping change, but Utility (via Energy Minister) said that couldn’t be done, and nothing could be done as they would go outside regulations through low voltage in summer at the end of the line – I went back (through the Energy Minister) to say I was disappointed, as their own logging showed 1 phase low, so if they shifted generation from other phases, to this phase (called “NETWORK MANAGEMENT”), then everyone would benefit – the Utility said they couldn’t do this, as the consumers decide where their PV generation goes, and changes may upset their (3-phase) equipment, and would have to be done by contract electricians at the individual consumers homes (at their cost). Talk about a wonderful management system! I did point out the Utility could ROTATE the phases going into a 3-phase home (with single-phase PV), to bring the generation onto the low phase. No, they couldn’t do anything, except perhaps tinker with the HV feed line transformer tapping. Time passed…. Now months later, even with the increased generation the phases are much better balanced, and throttling problem seems solved (for the moment – infill housing and more PV penetration may re-create the problem). I’m thinking the Utility responses may have been CYA – and the Minister may have directed them to sort it out. you forgot to mention 2 more advantages of 3 phase inverters. 3 phase inverters have the average panel voltage near ground, while in 2 phase inverters the average panel voltage is around half the dc value and has a grid frequency component. this means that there could be ac GFI trip problems, for example during rain and thin film panels with higher capacitance to panel ground. the other advantage is reliability . there are less capacitors needed in a 3 phase system, due to eased ripple current requirements. that is why 25kW, 3ph inverters are manageable in size and cost. 3 phase battery inverters? I can’t find any directly but I can’t see any reason why you couldn’t use a 3 phase solar inverter with batteries that are set up with a high enough output voltage. It’s just another DC source and provided it’s in the right voltage range it should work. Right? Square peg in a round whole. Solar inverters tend to be designed to just pump out maximum power all the time. Battery inverters tend to have a bunch of extra smarts to enable sensible control of how the battery is discharged. eg balance demand in the home and things like TOU etc. With Australia’s limited FiT for most people there would be no point in discharging the battery flat out and exporting excess power to the grid from the battery etc. Then there is the fact that battery inverters often include battery chargers etc, that solar inverters will not have etc. Agreed and valid points. Still not seeing these mythical 3 phase battery inverters anywhere except as part of a 3 phase hybrid inverter. Everyone is talking about batteries as some sort of Nirvana. They must all be very, very big users. My use is modest – any I find from a detailed look at our consumption profile, that we would only save less than one-third of the cost of the battery pack, over it’s projected lifespan – on top of that, it is big money up front, and I haven’t even figured in the lost opportunity cost of the extra inverter(s), battery chargers, and the installation cost. Financially, for me at least, an extremely backward step. Going off-grid saves the connection fee, but extra inverters, because the grid-tied inverter has regulated anti-islanding features and will not run unless the grid voltages are present. Not sure if on-grid, the inverters would operate from a high voltage (350Vdc?) battery – but would like to know. That’s the thing about the Tesla Powerwall, it will keep the solar inverters up (while the sun is shining) and powers the house while the grid is out. If there is excess solar, it will top up the battery. The Tesla Energy Gateway manages the grid connection and will island the house off the grid whilst keeping the inverters running (both the solar and battery inverter). The battery becomes the grid reference for the solar inverters, so they think there is grid power. When it senses grid mains has returned, it will reconnect the house back to the grid so that you can continue to export your excess solar or import power depending on the loads and supply. The battery in the Powerwall is 50Vdc. You may have misunderstood my words – maybe instead of saying I’d only save 1/3 of the battery cost, I should have said I’d only recover 1/3rd of the cost. After 10 years, I’d be out of pocket to the tune of 2/3rd the initial battery cost, plus the cost of installation and anything else required. Just doesn’t make economic sense. P.s. our Utility supply is very reliable – although I accept this is likely to be degraded with increased proliferation of domestic PV, unless more inertia and expensive synthetic inertia is added to the grid (e.g. SA, which has nearly twice the tariff that we have). I would not believe everything you read, especially if it is coming from a COALition or Murdoch media. 1. that the only way to have stability in the network is to have a lot of traditional spinning inertia (coal and gas). That Luddite argument used to have a full stop to it, but now even those who wanted to make that argument have had to change that full stop to a comma and suggest that the synthetic inertia is expensive. But the facts don’t bear that out. The big SA battery has allowed for a reduction in spending on FCAS services to be reduced from $109m in 2016 and 2017 to a forecast of just $3.6m in 2018 (ie more than 96% reduction in the costs). See https://reneweconomy.com.au/tesla-big-battery-claims-its-first-major-fossil-fuel-victim-30614/. A large part of this will be the fact that keeping large amounts of traditional “inertia” in reserve for FCAS services is significantly more expensive than what it costs to provide it via what you call synthetic inertia, because “synthetic” inertia can respond much faster, and in a much more meaningful way. Sure some of this cost reduction would also be nothing to do with that, and more as a result of the batteries ability to break the energy companies pricing cartel for these services. But that too is just as relevant, and I would expect to bring the same benefits as we install more distributed solar and batteries so bring to again reducing the cartels pricing monopoly and improve the supply and demand balances which allows the cartels to game the market to their profit. 2. SA power is expensive / unreliable because of large concentration of renewable power. Fact, SA power has always been expensive, long before the transition from coal to renewables. Fact the recent blackouts in SA were triggered by failures of coal and failures to bring gas online in failures and storms blowing down inter connectors. None of the expert reports are blaming renewable for the recent blackouts as near as I can tell. 3. We need coal and gas for reliable network. Not even the head of AEMO thinks that. ( https://reneweconomy.com.au/aemos-zibelman-transition-out-of-coal-does-not-mean-lights-going-out-32686/). Or the Finkel review or others actually dealing in this area. Unfortunately the COALition and Murdoch media continue to sow the seeds of FUD until it just becomes accepted and repeated fact by too many people unfortunately. I should also add, I totally agree about your sentiments about the prospects of many people being in a position to make an economics return from batteries as it currently stands. I could not make the economics add up even before the significant Tesla PW2 price rises, and much less after it. So for most people, without special circumstances, or significant subsidies, if the only reason you are getting batteries is to save money, there is probably a LOT of places you will find a better ROI (eg solar). But I suspect this is because most people are only using to load shift power usage, and there is not enough arbitrage between FiT and peak rates to justify. So when used like this, we have to wait for electricity prices to rise, and/or solar FiT to fall, and/or batteries costs to fall, or longevity to significantly improve before this changes. HOWEVER, when the market develops, and we are able to sell battery services at a premium for things that batteries are actually good at, this could quickly change. eg if we sell some of our battery usage to provide FCAS services, or during peak wholesale prices, and or to soak up extra power at times of low demand to discharge and help the grid at times of high demand, we could potentially be paid enough to change the economics substantially. But it does not look like we are there yet, without significant subsidies, or using assumptions that are unlikely to pay out. When the government and regulators are committed to the RE transition, I am sure they will start working the regulation that will promote this, and the investment required, but until then we are stuck in a nightmare of our own making (ie high electricity pricing living in one of the most energy rich nations on earth). To me, installing Solar PV, or adding a battery, should not necessarily be just about achieving ROI on the purchase cost – which as you say might have to await a significant subsidy, or for the price of power to increase. In my (non-self-centred) view, the economics of using a given technology should include recovering ALL of the associated costs – including the value of any subsidies (e.g. REBS), since after all, these are still costing us our tax dollar. Also, if the technology introduces undesirable features (e.g. the need for FCAS services, or an increase in the cost of power, or requiring an otherwise unnecessary increase in grid capacity), then these are costs that also need to be included. I agree that batteries are not “there” yet – except in certain special circimstances (TELSTRA have been using Solar and batteries for years in remote areas – very, very expensive, but cheaper than transporting diesel and servicing remote generators). I would dearly like to “load shift” our solar generation – today, we will produce around 37 units of power, but will use about 6-8 units overnight (lights, TV, cooking, refridgerator). Our tariff is about 26 cents/unit, FiT ~ 7c/unit, so every “shifted” unit will save 19 cents – not a lot, but it all adds up – just not enough to justify a battery system. Actually, the devil is in the detail on this 1, as to if it will work with an apocalypse battery or not. If you have 3 phase, and you install Enphase today it is VERY likely that it will not work with a battery in an apocalypse!! I know this because I am in this position, and have so far battled unsuccessfully to get this working. Problem is there are parts of AS4777.2015 that mandates even single phase inverters must shutdown on phase imbalance. It is Enphases implementation (which technically they must as I understand it to be connected to the grid in Australia since Oct 2016) that causes the problem. It is hard to get detailed information on exactly how they implement this. But it is almost certainly the Envoy-S that implements this, and commands the micros to shutdown when it detects a phase imbalance. Now if you have 3 phases, even if you convince your installer to only install the micros on a single phase (probably only likely if it is a very small system, otherwise your distributor will want you installing the micros across multiple phases to keep balance), it is still likely they will sell and install the Envoy-S which measures and gives you consumption stats across the phases (you will probably want this as well as it is really handy to understand your usage). When they do that, it will be connected to all 3 phases to measure the consumption, and I would be pretty confident that it is this that enables them to detect a phase imbalance and then they must shutdown the solar. If this issue was easy to solve, I am confident it would have been solved. I initially had a deposit and install scheduled with 1 of Enphases largest installers in Australia, with the assurance this would work (despite making my concerns VERY clear and pointing them at the area in AS4777.2015 which would appear to cause the problem). But eventually they twigged to the issue, and after almost 6 months of working with Enphase for a solution, decided to return my deposit and did not want to play any more and said it could not be done. I have now gone to a new installer, who said if needed, they would work around it by installing 3 individual Envoy-S if they need to to make it work. I am now installed with a single Envoy-S, and sure enough, no support for Apocalypse battery (ie if 1 phase goes down, all phases go down). I was installed over 3 months ago, and still have payment outstanding because it was agreed this would be resolved before completion of the project. They tried to tell me “Enphase was aware of the issue, and had a profile they could install when the battery was installed” and suggested that was enough to get their last payment. But I smelled a rat on this 1, as they could not give me ANYTHING to support this claim, and so far refused to install that profile and test. Last communicate with them is they will get onto Enphase again, and try to arrange for this to be done, but that was over a month ago, and I still not have heard anything. There is a solution that does work. And that is to install a pre AS4777.2015 profile, and then it does work fine. But technically I suspect this is not supposed to be done, and does have 1 other downside. These profiles do not support frequency ramping (ie progressively being able to throttle output as frequency rises. The PW2 and other frequency ramping battery solutions use this to control the solar output, so that they have a better chances of keeping the solar on when the battery is close to full and being able to supply household loads from solar. Battery should work without this, as PW2 will just raise frequency till the solar trips off, but this will lead to more cycling of the battery and banging the solar inverter on and off, which long term might not be good for longevity of the solar inverter. I could believe solution might be to install multiple single phase Envoy-S and micros and have NO phase coupling between phases. Expensive and probably not as nice as single Envoy-S as I assume production and consumption usage will be 3 separate systems rather than presenting a consolidated view. But I am also suspicious that there might even be issues with this in certain circumstances where for example you have a neighbor with phase coupling or similar. There is lots of evidence in Enphase’s install documentation can happen. I did also wonder about all sort of ways to work around it in install. eg having Envoy and phase coupler on the grid side of the gateway which isolates battery and home in a blackout, and thus impacts ability of Envoy-S to send instruction to shutdown micros. But that testing shows that it is WAY more complicated than you would think, and despite doing this, somehow the micros were still detecting phase imbalance and shutting down. Story is different if you have an only Enphase system (per AS4777.2015 as I do). Despite being installed across multiple phases, it does not need the Envoy to work, and will all work without an issue on phase imbalance. But of cause you have the same limitation I have outlined above with lack of support for progressive frequency ramping of solar output. I think the issue is really with AS4777.2015. When it was written, it is clear to me that it was not written with any thought for batteries, and certainly not apocalyptic batteries. I suspect the standard really needs to be updated to better allow the inverter manufacturers to cater for this. More attention needs to be brought to this issue, because I am sure there are a lot of people buy micro solar on the assumption this will work, and it does not. Just like people surprised when their 3 phase solar inverters do not work with their shinny new battery in a blackout. Anyway, my council, if you are planning an Enphase micro install (or any micros for that matter as I think the issue is not Enphase but AS4777.2015), AND 3 phase, AND you want a battery that can keep the solar going in a blackout, proceed with extreme caution. oint out the issue to any potential installer, and get them to agree you will only pay once you have tested apocalypse battery support. To test that, you don’t need a battery. You just need to shutdown 1 phase, and confirm the micros on the other phases do not shutdown. Matthew rework you battery storage from AC coupled to an independent and isolated solar PV DC coupled off grid solution working “in tandem with -but not connected with your existing system” and controlled by third party “remote smart monitoring and controls”. The loads circuits distribution between two or more power systems is managed and optimized dynamically by the monitoring and control system. Think more clearly about your energy solution objectives and imperitives from a clean slate perspective, and discuss this with you energy systems design engineer. I read your post again, and might have misinterpreted your question in my previous long reply. If you only have single phase power at the property, as Ronald says, you should be fine if the installer installs solar and battery to support this. Single phase certainly simplifies thing as long as you are not limited by its limitations (ie more restrictive rules on how much solar and battery you can have). 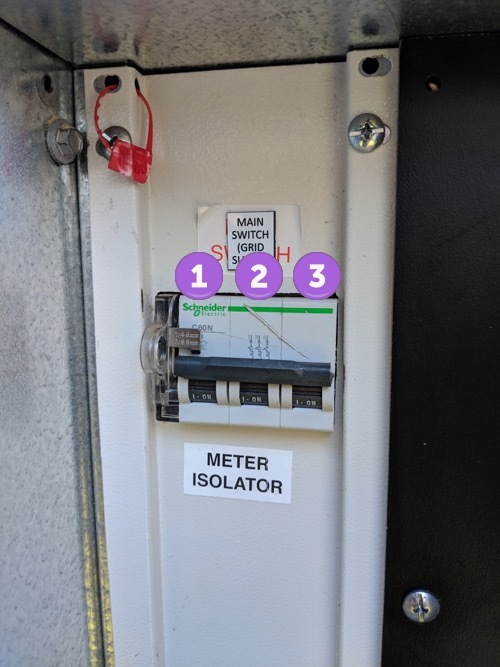 My concern in the previous post was to point out the potential problems if you actually have 3 phase power at the property, even if your Enphase and battery is only installed on a single phase. New Envoy-S / S270 micro system is 10kW. But I suspect it would not matter how big the system is if it is using Enphase micros and Envoy-S and monitoring 3 phases. Micros are on 2 phases. I can shutdown a phase with no micros on that phase and it will shutdown the micros on the other 2 phases. The issues of apocalypse batteries is an interesting one, although with the payback value being negative on most of its functional life, that is maybe less appealing. Having some power during a blackout would be nice, but I have generally very stable power locally, so it usually doesn’t happen much or for long. For an unshaded location the cheapest option is solar panels without microinverters or optimizers. For a shaded installation the decision is a little more difficult as it may be more cost effective to install more panels than use either microinverters or optimizers. It is possible to put optimizers only on panels that will be shaded and keep costs down that way. The economics of microinverters tends to work better for very small systems than larger ones. Where microinverters and optimisers excell is where a homeowner wants to get the most generation possible out of a limited amount of space. Especially if it is difficult to install panels at the same orientation. As for backup power, having a small generator can be more cost effective and (hopefully) reliable option. One reason is there may not be much energy left in the battery when a blackout occurs. We have a U shaped house, and the current 10KW designs we are looking at have panels on the East and North, with both aspects having two separate locations, depending on the system parts, and not all aligned vertically down the roof. There is capacity to have West facing panels as well if wanted. Shading isn’t really an issue – our own trees being the only likely shading, other than weird roof angles casting shadows during the morning or afternoon. Going three phase potentially lifts the 5KW export limit (for what that is worth, and presuming solar feed split across the phases), and prepares for things such as car chargers, heat pumps, etc, along with the improved voltage stability as per the benefits outlined by Finn. The cost of the system jumps about $2.5k going from mid range panels (Jinko 315W JKM315M-60) with a Fronius string inverter, to the same with Enphase IQ7 Micro Inverters, and then markedly ($6K more) stepping up to a tier 1 panel (LG NeON R 350W) with the Enphase IQ7+ Micro Inverters. Pretty much the same price between using the top panels with the micros or the same using a SolarEdge with P370 Power Optimizer Models. Brian when the time comes to think more about those higher consumption “potential day time services load circuits” consider expanding the solar PV DC Bus and running an autonomous “daytime off grid circuits” solution for greater cost effectiveness independent of the grid, and particularly the advantage this strategy offers for DC Coupling for charging battery storage for dynamic controlled night usage. Smart Net Meters automatically redistribute the solar onto all phases nowadays. You don’t need a 3 phase inverter. For spinning disk meters, yes you do, but not for the modern smart net meters. Finn, please do your research! Are you sure you have your facts correct? I have a 3-phase Smart Meter, but there is no way on earth that it redistribute power across phases to do this, it would need to be the size of, and have the capabilities of, 3 x single phase inverters – at least. What it does do, however, is to record the inports and exports occurring on each of the individual phases. I do have a 5kW 3-phase inverter – but this outputs essentially the same power on each of the phases – so as far as the meter is concerned, each phase may, depending on its individual load, be either importing or exporting power. To me an opportunity lost – as it would be nicer for power exports (from house to grid – their import) to be biased towards the lowest voltage phase – to introduce a degree of balancing. As it is, an excessively high phase voltage will cause the inverter to throttle back ALL phases, or trip out altogether. Our provider reads the meter – and we get get a FiT benefit for net exports across ALL phases – and of course get billed for the net sum of all phase imports. On reading another blog – I noticed the salesman, despite being repeatedly asked, did not answer the question about phase balancing – just answered the other questions in such a way that may make someone think he was confirming the phase balancing issue. Wow, you’d think with tge EU propping up Spain, that sort of largesse would be deemed criminal! When you say “zero injection”, I guess this means it is illegal to export any power to the grid (and you have no FiT). Seems crazy – Iberdrola could make money out of re-selling green power, at a significant mark-up. What you say about 3-phase inverters balancing their power output is one of the reasons I’m not so sold on them. You only have to lose any one of the phases, and the whole PV system will shur down – no solar savings until restored. Or, one phase goes too high, and all phase outputs throttle back or shut down until rectified – similar to you zero injection configuration. In reality, a 3-phase inverter is similar to 3 x single phase inverters in one, I’d think – just slaved together, and sharing a common dc supply. It’s a pity they don’t provide for a degree of optional “steering” between phases. recently since a government change it is now much easier to connect PV (autoconsume) as long as you do not inject. the administrative and technical hurdles to be able to inject are huge, but not impossible. same reason why there are no EV chargers in public streets. selling electricity is strictly regulated . giving away is allowed so modern supermarkets have chargers for their customers, but roadside chargers are rare. also because the connection rate is 50euro per kW per year, one of the highest in europe. Showing inverter brands we consider reliable and well supported in Australia. (It is below the graphic showing solar panel brands.) I believe all of these have have three phase inverters. If you are looking for a high quality inverter that will allow flexibility with panel additions then a Fronius inverter would be a good choice. Then select “Maintenance or upgrade of existing system”. 1. Replacing your old solar system entirely with a new large one. This can be a good choice if your current system is small and old. 2. Replacing your old failed inverter with a similar sized single phase inverter and then when you want to expand install a second new system with a 3 phase inverter. If you do decide to expand your existing system you may want to consider replacing the inverter and adding additional panels at same time as this is generally cheaper than getting them done separately but one of the two options above will usually be more cost effective. I have 3-phase, and when purchasing a PV system, specified 3-phase inverter (SMA – rated at 240Vac) – installed 27 months ago – because I thought this was the responsible thing to do (to help balance the phases). Initially regretted my decision, as 2 phases were reaching over 254Vac, and the third remaining at about 243V. The higher phase voltages were often initiating throttling of the inverter – which acts across all 3 phases – and was reducing my generation and export capacity. If I had a single phase inverter, I could had moved this onto the lower voltage phase to prevent early-onset throttling. 1. 3-phase inverters cost more. 2. A 3-phase inverter will still be exposed to excessive voltages. In my case, I contacted the Utility – who logged my meter but concluded they couldn’t do anything without other consumers at “the end of the line” going below the minimum allowed voltage. From inspection of or local grid I didn’t believe this – so escalated my request through our local minister – who wrote to our Energy Minister – after all, all of us were paying for additional parasitic losses and suffering premature equipment failures unnecessarily. Got a response that appeared to me technically inaccurate (easy answer! ), so went back a 2nd time – when the Utility told the Energy Minister they couldn’t do much, but would attempt “tweeking” the sub-station voltages. Took quite a long time – but guess what? This morning, our grid phase voltages all hovered around 236Vac, and yesterday at midday they ranged from around 240 to 244Vac ! Both days have been hot, and cloudless. So – it might be worth challenging your Utility to prevent a repeat of your experience. I like Ron’s suggestions as well. If you go 3-phase, you will need to either put batteries (plus charger, etc.) on 1 phase, or else have 3 sets of batteries – as best I understand. Would appreciate comments from Finn or Ron on this aspect. If you want to have the ability to have blackout protection AND keep AC coupled solar running in a blackout, you should avoid 3 phase solar inverters all together as the solar will not work in a blackout. Single phase inverters will be a better fit of this if required. Even micros will need a very particular profile which you should make sure your installer will provide for you if and when you get a battery. If they don’t know why a micro systems installed on 3 phases will not work in a blackout, and why they need a very particular profile to allow it to work, find another installer. If you don’t care about blackout protection, or happy with blackout protection from the battery only without solar support, a 3 phase inverter will be fine for this. A three phase inverter will work with existing panels provided there are enough panels and they are wired up in such as way as to meet the 3 phase inverters requirements. If the 3 phase inverter is the same capacity as your old single phase inverter there is unlikely to be a problem but it is important to check as they can and do vary. 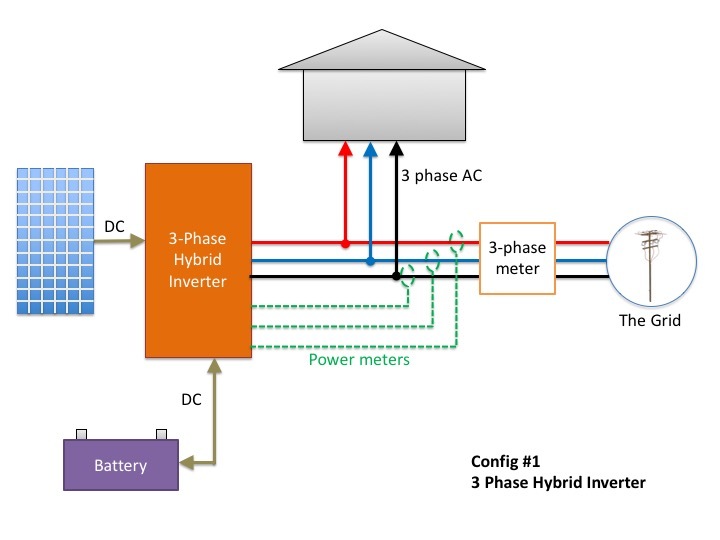 A 3 phase inverter will work to balance output over the 3 phases. Because of this it can help avoid, or at least lessen, problems caused by grid overvoltage which can cause your solar inverter to either ramp down its output or temporarily shut down altogether. With respect, I have to largely disagree with your comments about 3-phase inverters helping avoid or lessen grid overvoltage problems – at least in regard to my SMA 3-phase inverter – and I suspect all others. From careful monitoring, my inverter tends to output approximately equal CURRENT into each phase – if anything, putting very slightly more current (and therefore power) into the higher of the phase voltages – although this effect is small. So, it cannot avoid high grid voltages except by throttling back output over all 3 phases, if one of the phases goes high – perhaps caused by the Utility transformer settings, or because neighbours have single-phase inverters on that phase, or that phase is more lightly loaded (or a combination of these things). It will lessen overvoltage caused if you have high impedance supply lines – partly because the current is shared over 3 lines intead of 1, but otherwise, again if the high grid voltages are externally generated (as was my case until the Utility finally addressed the issue), the inverter can only deal with overvoltage by throttling back output, or shutting down altogether (hasn’t happened to me, but I’ve heard stories from others). I do agree that if everybody had 3-phase supplies, and all used 3-phase inverters or single-phase generation was carefully balanced across the neighbourhood, and grid loads also remain balanced – then 3-phase will help the cause. That is the only reason I went for 3-phase. Ian, by extension wouldn’t that problem be excaverbated on a single phase inverter where you are diverting all the amps to a single phase? 1. My experience in the suburbs is that the incoming line impedance is relatively low – so that the main impact is caused by a high local grid voltage, brought about by too much distributed generation on that particular phase, or an unbalanced load, or as in my case (I believe), too high a tapping on either a local, or a sub-station transformer. 2. Due to the low line impedance from home to grid, dividing the current by 3 will of course have a small beneficial effect, but in my experience this was absolutely swamped by the inbalance in the grid phase voltages. With single phase on a 3-phase supply, you’d do much better by swapping to the lowest voltage phase, rather than using a 3-phase inverter (which will be prone to throttling). Having said all of the above, one of the things I noticed, was that one phase had excessive voltage in the late morning, and another in the early afternoon – seemingly caused by how West and East oriented PV systems are connected to the grid. One of my phases remained consistently low, which is what I would have connected to if I had a single-phase inverter. The best outcome (which I managed to achieve, albeit a difficult process), is to have the Utility fix the problem. We regularly had phase voltages all over the place (badly out of balance, and often exceeding the throttling voltage of 254 volts), whereas now the voltages range between 236 and 244 Vac, and are seldom more than 2 volts different. 3. You really need to know what you’re dealing with, and either seek help from the Utility, or otherwise probably stay with single phase if the phases are badly imbalanced by either loading, or PV generation – or both. I agree with Ian’s reservation about 3 phase inverters. But my primary reason is because I value the ability for current or future batteries to support be supported by solar during a blackout. This will likely never be possible with current 3 phase solar inverters with any battery system that uses AC coupling and frequency shifting to control solar output. But to expand the discussion on the voltage issues Ian outlines with 3 phase inverters, which is potentially a real concern for some users, there is some rays of sunshine on the horizon. AS4777.2015 does have option for “Voltage Balance Modes”, which some 3 phase inverters might (or might not) implement to practical benefit of people in the situation that Ian outlines. Ie the inverter is allowed to output more current on the low voltage phase. I have no idea if any actually implements this, as I am guessing implementation would add to the expense and complexity of the inverter (I have no idea if it would be trivial or significant). 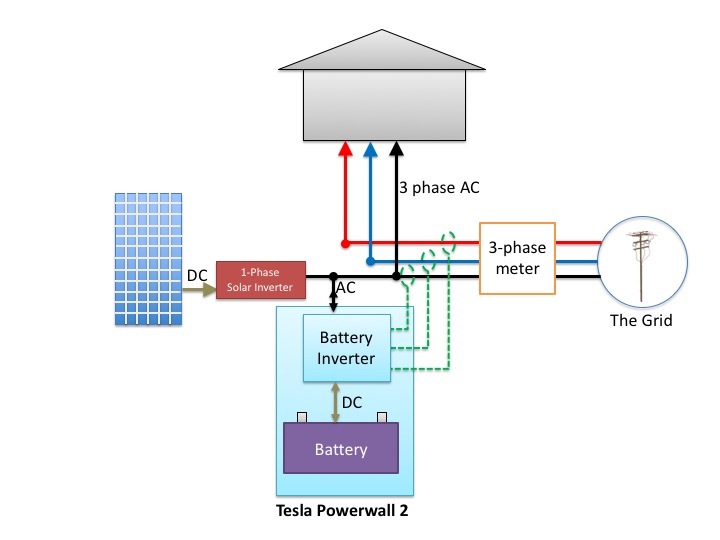 But if they do, and if this implementation is flexible enough it might allow for full inverter output in circumstances that some 3 phase inverters can’t and provide the added grid benefit of working in a very practical way to help balance the grid which is a service that goes beyond the home owner. 1. Mandating the support of “Voltage Balance Modes” which has the twin benefit of help end users with grid over voltage issues on 1 or 2 phases but under voltage on others, as well as helping balance the grid for everyone. Of course the cost implications of this need to be considered, and if too expensive, it should be optional, with a requirement for vendors to clearly say at point of sale if this features is supported. 2. putting sections in to better allow connections of batteries and support for solar in a blackout. eg allow 3 phase inverters to continue to output on a single battery backed up phase in a blackout where the other phases are down. Anyway, the issues are not trivial, so good for sights like Solarquotes to contribute to the dialogue and shine some light on the issues. Assuming panel capacity is the same a three phase inverter reduces voltage rise caused by you own system. Also, depending on local conditions can potentially benefit from lower voltage on one or two of the phases. 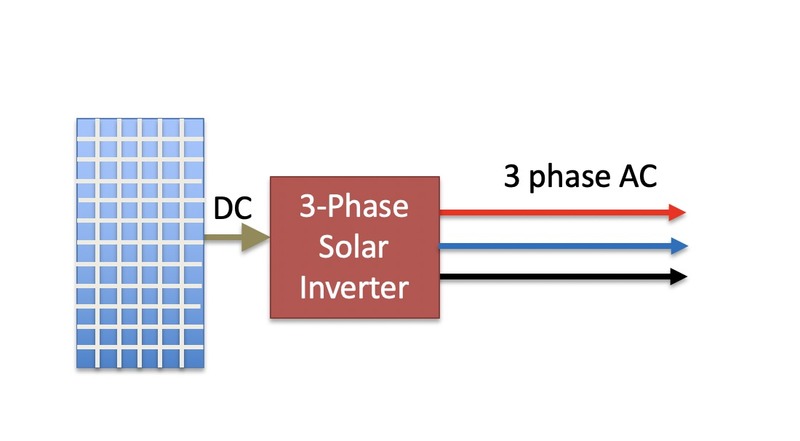 A three phase solar inverter will typically try to export solar electricity through all 3 phases. I assume the phase currently on tariff 33 just has a normal meter that isn’t able to record exports. If so your inverter could be sending surplus solar down that resulting in you losing a portion of your solar feed-in tariff. If this is what’s happening and you get a single 3 phase meter then, with a 10 kilowatt solar system, I would say you should save about $1 or more per day on your electricity bills. 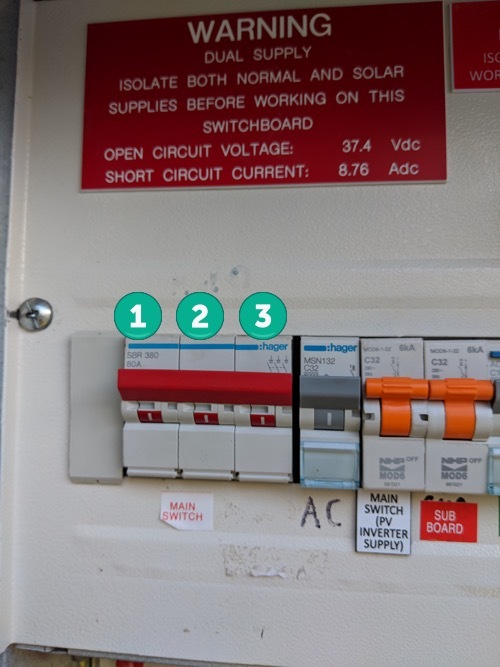 If you get a single 3 phase meter you can put what is currently on tariff 33 on a timer so it will switch on during the day and so mostly use solar power. With a timer you can adjust yourself you can make sure your hot water system — or whatever you may have on tariff — always receives enough energy. The decision to opt for a system of this size, (rather than say a 5Kw), was made in an effort to offset the power demands of a proposed 16Kw ducted air conditioner. The selected aircon system requires a three phase power supply. I am trying to establish if the entire output of the Solar PV system is available to power the air conditioner. Does the single phase inverter supply power to all three phases or to only one phase? If the answer is only one phase then would that mean that power for the other two phases going to the aircon will always be entirely supplied from the grid? If so should I insist on a three phase inverter? The good news is the entire output of the solar system will go towards meeting the power draw of your air conditioner before any grid power is used. A single phase inverter will only supply supply power to one phase, but your electricity meter will look at the power being exported by the phase your solar system is on and subtract that from the power being imported on the other 2 phases to determine how much power your home is using. For example, if the phase with the solar inverter on it is exporting 4 kilowatts of solar power while the other two phases are importing 2 kilowatts each of grid power, then as far as your electricity meter is concerned your home is using no power at that time. Note that a 16 kilowatt air condition supplies up to 16 kilowatts of cooling but its electrical draw should only be around 4 kilowatts when operating at full power. Because you have three phase power I suggest looking into getting a three phase inverter. This means you won’t have to export limit and your solar panel capacity can pretty much be whatever will fit on your roof. I have a SolarEdge inverter with optimizers. Ask your installer to look into Jinko and Trina solar modules with Maxim Integrated optimizers. These are tiny ICs (integrated circuits) built into the solar panel itself. Each of these manufacturers should have something available. In addition, Jinko has a back “thingy” with 3M sticky tape which has intrigued me, but I am not sure if it is offered with the IC optimizers. Maxim claims to have have a similar performance as hardwired optimizers on the back of solar panels, and they could, also, have a price advantage. I have a similar 3-phase setup as your proposed system. My array is about 10% larger than the inverter’s nameplate capacity. Somethings to keep in mind with the SE inverter-optimizers: in the future if you want to add a battery system, then you are boxed into a particular set of options. If you want to expand and add DC or AC coupled systems, then your options need to consider the first system. The cost for using these optimizers was about 20%, if this is a concern, then the Maxim route opens up other inverter and battery systems solutions. Another issue I have is that any software changes need to go through the installer. Other inverters may or may not have these problem; however, keep in mind that your control and interaction with an inverter is through software, and some companies provide more of an open access to their customers. If you live in a remote area, like I do, this could be an issue. I keep,running into these wisdom good nuggets. I for one I am thankful for the article. I have been thinking lately of running a second, independent, 3-phase hybrid inverter precisely due to the difficulties exposed here. This second inverter would have its own set of solar panels. The purpose of this second system would be mostly for self consumption. The hybrid inverter I have in mind has the ability to limit exports to zero, and it would be DC coupled to a battery for emergency power. The one issue I have is there would be two solar systems behind the same grid meter, and I have not thought out yet all of the possible issues coming my way. Would you mind pointing out any obvious minefields associated with this behind the grid meter two solar system setup? Should be no issue, and lots of people including myself have multiple solar systems. They don’t really need to know about each other. If you need to do export limiting, they probably all need to support export limiting, and be configured so the total export limit is not less than the sum of the 2 export limit on each system. The only thing I can think of, is were you wire the non hybrid inverter with relationship to the hybrid inverter. Using a hybrid inverter and DC coupling the solar and battery avoids some of the downsides of AC couple solar and battery. Ie for the right setup solar and battery should restart when the sun comes after a flattened battery, and you avoid a whole can of worms with no support for 3 phase solar in a blackout you have when you AC couple solar and batteries. But you will want to make sure that the old solar inverter is not connected behind the backup circuit, unless you hybrid inverter supports AC coupling. I would look closely at your battery options. More of the better priced solutions seem to be favoring AC coupling and the simplicity of AC coupling means that I would not be surprised if this is the way the market continues to move. But not if you go with 3 phase inverter, you will probably preclude yourself from AC coupled batteries in the future and having solar running in a blackout support. This technical limitation with 3 phase inverters and AC coupling is the primary reason I would think twice about 3 phase solar. My first choice is the Fronius Symo Hybrid 3-phase inverter. It has the ability to play nice with my existing FIT grid tied 3-phase solar system (AC coupling). It seems to be able to limit the export of excess energy, and it, also, works well with my current house 3-phase electrical system, and in addition, it has an accessible software interface to change parameters. An energy export limitation will be of importance for this second system since my utility has changed the ‘rules of the game’ since I installed the first system. My utility is now paying less for energy fed into the grid than for energy that I consume under the new FIT rules, and it has added, also, a net metering scheme. I have at home both a consumption and a production utility meter, and at this time I am not sure how they would work out the actual billing under a net metering scheme. In addition, I have discovered that this new set of rules strongly encourages self consumption of energy to make the economics work on my favor. The above mentioned inverter has many user friendly options for this purpose. Both the (unknown to me) new billing of energy and increasing my level of self consumption of energy are new rules to which I am trying to adapt as best I can. as FIT schemes are becoming worseover time, selfconsumption and feed in limiting becomes more important. the smart connection of storage techniques like heat pumps will determine the choices of inverters. many heatpumps have only target temperature as input control parameter. only recently in germany there are developments of integrating household equipment into the loop. when the storage equipment like heatpump is singlephase, 3 single phase inverters may do a better job for unbalanced loads in a 3phase connection. in spain for example, zero feedin in a 3phase system means zerofeedin current in each of the phases. so when there is an unbalanced load,the feedin for a 3phase inverter needs to be set at the lowest current of one of the phases. I find the work with heat pumps (both for hot water and space conditioning) a great breakthrough in efficiency. I recently found a hot water device called an energy diversion device that follows quite nicely the contour of the solar production curve. Whenever energy was available it would kick in to divert a little bit of energy for hot water. It seems to be able to do this by monitoring all the energy loads and all the energy production. When enough energy is available it goes to work. I have seen something similar to this with some of the inverters, but they still require external devices. I wonder if they will one day make this a part of the inverters. I for one would like to see this capability for both hot water and EV charging as part of the inverter’s capabilities. It could simplify the path from generating the energy to using the energy efficiently. SMA is leading the efforts by adding EEBUS HVAC functionality to their homemanager.(https://www.sma-sunny.com/en/heating-with-solar-power-at-no-cost/). they already had incorprated the stiebel eltron heatpump connection. Many heatpump manufacturers will jump the EEBUS bandwagon,and we can see heatstorage as an addition to battery energy storage. you can store energy in a radiating energy storing floor,(you can increase the energy storage capacity by adding phase change materials to it), or in a hotwater tank, used for heat exchange for shower water or low temperature floorheating.similarly the floor can also be used for cooling. controlling the power drain of the heat pump is essential,and can only be properly achieved by frequency regulation of the compressor speed. then the dynamics of controlling all this such that there are no instabilities, are a major challenge. The high thermal mass of the floors,added to proper insulation and low heatloss allows to overcome the night’s ,and you can pump up your floor during the PV day. I appreciate the sharing of this information. It makes it seem so much simpler. I don’t know if you ever read the adventures that some of the early off grinders went through back in the 1960’s and 1970’s, but they would have probably felt real groovy with such a setup just as I would. My one concern as I read your comment was regarding condensation when cooling the floor. How are they getting around those little drops of water? In any case, the depth of the integration level is absolutely amazing. How the heck did we ever deviate away from such a path? Hi Eric – no reply button on your post with the YT link about batteries. The simple answer to your question “How the heck did we ever deviate away from such a path?” is that we found something much better in terms of bulk and weight in the various Lithium chemistries. Lithium is the lightest metal in the periodic table and as such offers the most Wh per kilogram. I am not entirely convinced that we really found something that is much better. A Nickel Iron battery will degrade over time due to use and temperature just like any other battery such as a Lithium battery. However, suppose you spend $20,000 of hard earned money into a battery bank which you expect to use over the next 30-years. A Lithium battery bank with luck will degrade about 30% every 10-years, and a Nickel Iron battery bank will degrade about the same amount. With the Lithium battery bank you will lose another 30% at the end of the second decade, but with the Nickel Iron battery you dispose of the liquid inside the cells. You wash the inside of the cells (the electrolyte), and with about $30 dollars worth of new electrolyte you pretty much have a new battery ready to start its second decade. The electrolyte can be neutralized with an acid (like vinegar) since it is alkaline, and it can then be safely disposed. At the end of the second decade you will feel lucky you spent $20,000 in Lithium batteries, and you will go and buy a new Lithium battery bank. In absolute terms it will be cheaper than the original battery you bought 20-years ago; however, because of inflation and depreciation your money will be worth less, and it will be equivalent to spending another $20,000 from 20-years ago. The buyer of the original Nickel Iron battery bank with a clean electrolyte inside will go do nothing else since his battery bank is still working fine thank you very much. In terms of progress try to understand who bought the original Edison Nickel Iron battery, and why did they close it shortly after buying it. It had nothing to do with progress, and it had to do everything with profits. 3 phase inverters used in solar PV and battery systems is a considerable leap forward over 1 phase systems from both an engineering perspective in every category, and equally importantly a system cost benefit analysis. There is no functional penalty for 3 phase end users only gains, and also opportunities not available in single phase systems for polyphase machinery circuits and other equipment including ovens etc. 3 phase solutions are a must have in rural PV and battery solutions (either on or off grid – or both which is becoming a popular configuration in rural situations where irrigation pumping is common) but may not be in such high demand in domestic installations yet, but this will change. Energy systems design engineers don’t have to look any further than the fact that compared to single phase circuits three phase circuits provide 1.732 time more power with the same current, and this provides for considerable cost savings that migrate thru the overall system design because: reducing the system current requirements reduces cable sizes; circuit protection devices; and wasted energy by reducing I2R (copper) losses due to heat. The same efficiency and cost benefit gains applies also to battery DC sources as well, with system design trends now to lower the current from unsafe and dangerous levels and increase the battery storage voltage considerably to more efficient values. 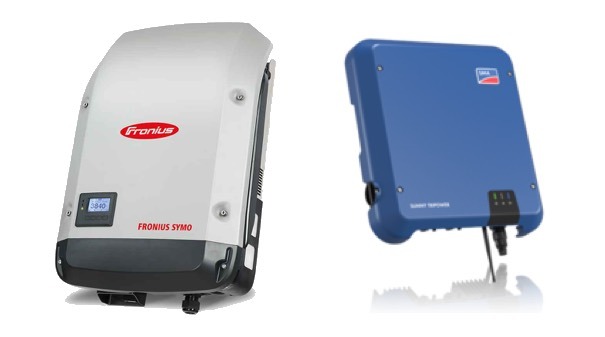 Fronious Symo Hybrid inverters for example, accept a 400 VDC battery source input but are only compatible at this time with Fronious Solar Battery; LG Chem HV; or BYD BBox. Off Grid 1 or 3 phase solar PV and battery solutions that I am involved with since 2010, operate at 480 VDC nominal at proportionally less current than 48 VDC solutions for example, which provides a huge system safety and functional benefit overall. I am not sure the statement “There is no functional penalty for 3 phase end users only gains,” holds true in call cases. For example, if you want a battery that uses AC coupling (eg Tesla Powerwall 2), a 3 phase grid tied solar inverter will never be able to work with this in blackout. Sure, you can ignore the AC coupled battery solutions and go for DC coupling / hybrid inverter solutions. But currently from what I can see in terms of bang for $ in terms of $/kWh, decent kW output including in a blackout, decent battery recharge speeds, UPS failover times, supporting existing solar etc, currently for grid connected people the AC coupled solutions are winning in the bang for $ race. And as soon as you go down that path 3 phase solar inverters are not going to work in a blackout. So as with all things, it comes down to your priorities and requirements and as near as I can tell it is all a compromise. It is just about knowing the pros and cons of each approach. – less problems with PVcell leakage currents as the average AC voltage on the panels is zero. I am a bit off the 3-phase topic but anyway…. Fair comments Matthew but that’s not where it ends. You have exposed some features (or lack of) that underpin the immutable concept of obsolescence in all technology design, PCE being in the spotlight at the moment. You are by default, a player and influencer in promoting obsolescence in PCE design in fact, by presenting well-structured and logical technical arguments to other practitioners and end users as you have on this particular Solar Quotes blog topic. Along with millions of other Matthew’s globally; collectively that’s what drives design change. Power engineering technology design is rapidly evolving as we all know, and it is fair to say that everything on the shelf today is obsolescent already (not obsolete though just yet). That is why we see a continuous stream of new models of PCE released every other week. If you followed the global PCE/Battery Technology Conference/Exhibition circuit like many practitioners do, you would see this unfolding from exhibition to exhibition at astonishing pace. But having said that, it is useful to understand that commercial manufacturing imperatives demand volume markets to survive and to also ride the sales wave until it is exhausted. iPhone might be an example of this in play. Design manufacturers are more reactive to external forces than proactive internally including PCE, and the downside is that some “entrenched old design chestnuts” can hang around too long, which is what happens until some company “breaks-out” a new innovative PCE design concept that integrates and controls DC coupled higher voltage Battery Storage and Solar PV with smart PCE, which is not yet mainstream design in grid tie technology, but unfolding incrementally. Back to your comments. What you are really describing is that current PCE is not dealing efficiently and as well as it could be from an end user perspective, with the integration and management of Solar PV and Batteries (the System DC Bus). For those of us who are involved with PCE design and manufacture this is definitely the case, and it has been an embarrassing sticking point for PCE design engineers for several years for a host of reasons, one being that PCE design manufacturers are not battery design manufacturers as well, nor are they systems integrators, and this point has prevented best engineering practice integrated designs from being seriously considered or getting any traction. Tesla broke the mould though and recognised this key point from an EV perspective and vertically integrated as both PCE and Battery designers and manufacturers. All of the necessary tools were finally in the one toolkit. Tesla was therefore in the right place to float similar EV PCE design principles across to stationary RE battery storage applications. You will recognise the same outcomes from BYD; from EV’s to BESS. Over a short 3 year span I recall being involved with 48 VDC EV battery stack drive trains through to working in Detroit last year on 900+ VDC battery stack drive trains. This should tell you something about BESS technology concepts moving forward. So there is a lot of EV power-train technology concepts packed into a Powerwall. But there is still a long way to go (but the sales wave is not yet exhausted). Tesla needs to be very cautious and not get to comfortable with their BESS though, it is a long way behind world’s best practice design and functionality for what customers need globally. The same immutable laws of obsolescence apply to Tesla as they apply to any other technology company. So what might all this mean for traditional PCE designers/manufactures like SMA; Fronius etc who don’t have the EV connection in play. Amalgamations and takeovers will be the norm, and the EV industry will overwhelm the PCE industry and dominate this space in the near term. I live on Bonaire an island in the Caribbean. Our power is 3 phase 112-127V, 50Hz. Our home has a mix of 127V and 240V outlets with the aircos, refrigerator etc on 240V, lights etc on 127V. We have a large unshaded south facing roof with a 9 degree inclination. The utility has just started to allow grid tied systems. Power costs 30c/kW/h and the Feed in tariff is 5c. So solar seems an ideal option. I am considering a 27 module system with three single phase inverters. People who have had these installed are suffering from premature inverter failure. After reading this blog I am rethinking and considering a 10kW three phase inverter. Would currently available 3 phase inverters play nice with our 112-127V/240V 50Hz grid? I’m afraid I’m not familiar with your grid. Here I would recommend a three phase inverter over 3 separate single phase inverters, but I don’t know what is available where you are. Since you are in a humid location I definitely recommend using PID resistant panels. Looking at the voltage in Bonaire, single phase is 127VAC 50Hz and 3 phase is 220V AC 50Hz. Which makes sense – 127V on a single phase you would not get 240V on 3 phase. (127V x √3 = 220V approx). If lots of people are having failures with single phase inverters most sensible course of action would be to find out why before purchasing any inverter. Is it the local grid causing inverters to throttle? Is it a particular brand of inverter? The salt air and humidity? Ron’s right about not knowing enough about the local situation but in general it’s cheaper to buy a high quality 3 phase inverter over 3 high quality single phase inverters. I would definitely be doing my own research and writing to manufacturers about whether their three phase inverters cover your grid voltages. And particularly more relevant in off grid solutions than on grid of course, as the System DC Bus (PV + Storage eg) can be easily and more efficiently exploited without compromise in an overall power system design. Integrating self managed Solar Thermal closed heat exchange systems in best practice off grid solutions is a must have for sure, as are variable frequency drives, on any and every water pumping application. I feel like my original goal got sidetracked. I am still trying to find a solution for using Nickel Iron batteries. Battery banks made from these batteries usually have a voltage of 12, 24, or 48-volts. The 3-phase inverter that I like from Fronius (Symo Hybrid) seems to work well with battery banks charging at high DC voltages of several hundred volts. A different 3-phase inverter from MPP solar works well for charging batteries at 12, 24, or 48-volts minus all the bells and whistles of the Fronius inverter. In addition, I need to make an AC coupled installation due to an older existing solar installation, and both of these inverters will accomplish this. Would anyone have any recommendations one way or the other? Eric – that’s rose coloured glasses stuff. You can’t just replace the electrolyte because the other components in the battery wear out as well. That’s called entropy. Same as the electrodes wear out in a lead acid battery, the electrodes wear out in a nickel iron battery. What’s more they have a number of serious disadvantages for home storage over competing technologies. Here’s an information page I found from a power and solar company detailing the issues (and positives) with NiFe batts. Saves me doing it. It also details why you’re having problems finding any equipment designed to support them. This guy has lived with his family off grid for decades (first in Colorado and then in Hawaii). They have relied on batteries for night power for many cold winters. He is on his second set of NiFe batteries. The first set he owned of NiFe batteries (from Hungary) used to foam due to oil floating over the electrolyte and reacting while it off gassed. He left all his energy systems with most of his belongings when he and his wife moved to Hawaii to save money in moving expenses. If you want really catch my attention, then I would want to see you fixing a lithium battery that went wrong in the garage of your own house. Afterwards, I will start paying a more serious attention to you and your reports. I personally wish I had half the ingenuity at solving my energy problems that these two guys show in their videos. For me they are worth more than a laboratory report on battery performances. These guys are living this stuff daily, and they and their families share equally in their successes and tribulations, and to me they are a source of inspiration for living and relying on their own and with their own resources.